The FindPt command is much like the FIND command, except it works on the Raw Description of Civil-3D Points. Type FindPt at the command line. At the prompt, select the points you wish to search, or type "PO" to select points by Point Group. You may also type "ALL" to select all points in the drawing. Right-click or hit ENTER when you have finished selecting points. Enter the string to use as the replacement text. By default, the Find string is case-sensitive. Check this box if you want to use a case-insensitive comparison. When this box is checked, the Find string is treated as a Regular Expression. You may use any of the standard Regular Expression codes in the Find string. And if you use parentheses in your Regular Expressions, you may use the $1, $2, etc. identifiers in the Replace string. Check this box to indicate that the Find string should only match whole words. If this box is not checked, the Find string will match even if it is part of another words. 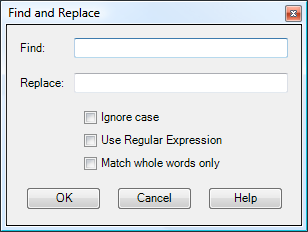 This option cannot be used if "Use Regular Expression" is checked. Find and Replace text in the Name or Description of Parcels. Zoom to a Cogo Point by typing the Point Name or Number in the command window.